In 2008, Dr Eilish Cleary was appointed Chief Medical Officer for Public Health for the Province of New Brunswick. That same year, the provincial Department of Environment released the results of a 13 year survey of domestic well water (groundwater) in New Brunswick. Among the findings of the survey (10,500 samples) was that nearly six percent of sampled wells contained arsenic concentrations ABOVE the guidelines recommended by the provincial Department of Health. Other minerals found at higher than recommended levels included chloride (3%), fluoride (5%), iron (28%), lead (3%), and uranium (2%). Some of these (e.g. lead) are known to be harmful to human development. There were some distinct regional problems as well. Nitrate contamination, for example, was a significant problem in the Grand Falls region (nitrate in ground water is often a result of fertilizer run-off or problems with septic fields). Astounding? Surprising? How many New Brunswickers know that over 30% of domestic groundwater wells in the Province were reported to have detectable levels of coliform bacteria and over 4% contained E. coli? That suggests some widespread water quality issues and, perhaps, human health issues. To make matters worse, public health officials have, for at least the past decade, been raising the alarm over antibiotic resistance in bacterial pathogens. Should that not increase our concern over bacterial contamination of domestic water? Given those numbers, you might think that some sort of PR campaign to bring this issue to the public’s attention would be mounted and perhaps request more resources from the Provincial Government to address the problem. Unfortunately, not much appears to have happened. Insofar as I know, there have not been any large-scale follow-up studies to determine if the problem has improved or worsened. Why not? What is the level of risk to residents of the Province? Wouldn’t you expect the Public Health officials to take an interest in drinking water quality? After all, we all drink water and contamination of water certainly poses risks to the health of New Brunswickers. I don’t see much publicly-available evidence that the head of Public Health launched any significant campaigns to urge that those issues be remedied. Were any large scale studies carried out by Public Health? And why, given the available information, were few if any questions on this issue directed by media to the former Chief Medical Officer, during the period 2008-2014? Public Health has collected data on vaccination rates in schools for a number of years. In 2013, the Chief Medical Officer released a report on immunization that showed a decline in vaccination rates and an overall poor level of immunization. Now, vaccination is well-established to be a critical method of reducing disease and mortality in both young and old, so you’d expect that a survey indicating that vaccination rates were too low and falling would set off alarm bells. But here’s the thing – lower than desired immunization rates in NB is not a new problem; it has been a problem for years. Immunization rates have declined since 2008. What did the Chief Medical Officer for Public Health do in response? True, vaccine schedules have been revised and new products introduced, but was much done to raise the issue with the public? Is there any evidence of an increased deployment of funds from the Public Health budget to raise this issue with the public? Any evidence of a significant PR campaign with repeated media interviews? Were other issues that perhaps posed relatively little risk to New Brunswickers (compared to identified water quality problems or low vaccination rates) given more Public Health office resources? For the most part, Chief Medical Officers for Public Health in Canada are persons who have been trained in medicine – medical doctors. If you talk to your family doctor, you will find that many of them are quite willing to discuss the relative risks of one treatment versus another. So I assume that they receive some training in risk assessment. Public health assessments of risk, however, are a bit different. It is not just the acute or chronic toxicity of a material or interactions between different drugs that matter; there is also the risk of exposure to the material. If a naturally-occurring or man-made material X has a certain toxicity, what is the likelihood that an individual or a population will be exposed to that material? And what are the likely levels of exposure? Risk is a combination of the hazard posed by the product and the likelihood of exposure. If you have a highly toxic material but exposure is very unlikely, then risk is likely to be low. If the toxicity is very low, and exposure is likely, risk is also fairly low. Many people are unwilling to accept the idea of relative risk. They want assurances of ‘safety’. Any risk from a particular product or activity, no matter how small, is unacceptable to them. They don’t seem to realize that they take risks (calculated or not) every day, and that governments and the private sector subject us to risk every day. Regulations, inspections, training, education, etc, are used to reduce risks, but risks still exist. That’s why you sign waivers before that zipline experience or that carnival ride, why you salt and sand the sidewalk in winter, why you fasten your seatbelt, and why you do everything you can to reduce the chance that your peanut-allergic son won’t be exposed to nuts at school. You can never be absolutely certain (despite regulations) that the organic apple you just bit into does not contain pesticides; you can be pretty certain, however, that the risk of that apple containing pesticides that pose a significant threat to you is low. Then we have the “Precautionary Principle“. Although many interpret the use of this approach as a way to guarantee safety, it is nothing of the sort. It is simply a risk analysis that puts the onus on the polluter to provide evidence that risk is low. In other words, if you have a new product or practice that might reasonably be thought to cause harm, the onus is on you to provide evidence that risk is low. You can’t just say ‘no evidence of harm, so I can go ahead’ when the product / practice is new or little-studied and little evidence exists one way or another. It’s on you to carry out the work to demonstrate low risk. Again, the Precautionary Principle does not guarantee safety. It is designed to provide a reasonable amount of evidence that the risk is low. Pesticide regulation in Canada does not invoke the Precautionary Principle directly, but the end result is similar. The regulatory process demands a wide range of tests that must be met before a pesticide can be approved for use. These tests are not infallible, but they do reduce risk. If you are the Chief Medical Officer where do you allocate your resources? Towards issues where the risk / exposure is greatest? Or do you treat all issues as posing similar risks? If you use your resources in such a way that low risk issues get a great deal of your attention and higher risk issues get less attention, are you doing your job? Are you practicing risk assessment properly? And should media be monitoring your use of citizen-provided resources and questioning whether you are using those resources wisely? The extraction of natural gas from shale has resulted in massive increases in gas supply in North America. Stimulated by relatively high prices for gas in the early 2000s, the shale gas industry rapidly expanded, and New Brunswick’s small shale gas industry saw opportunities for growth. Several companies began exploring for shale gas deposits and previously identified reserves received more attention from industry. The extraction process used a technology called hydraulic fracturing, or ‘fracking’, which required the use of pressure-injected fluids to fracture rock formations, thus allowing gas to be extracted from underground deposits. The process raised alarms from those concerned about introduction of chemicals into underground water reservoirs (used for drinking) and the seismological impacts of injecting pressurized material. The rapid development of the fracking industry in parts of the United States and reports of contaminated groundwater resulted in opposition to the industry. The proposed expansion of the industry in New Brunswick alarmed many in the Province. In 2012, the Office of the Chief Medical Officer for Health released a report that called for a number of regulatory actions to reduce potential harm. Boomtown effect: The ‘sudden’ arrival of industry or any sort of economic development in an area may result in large increases in population and income. These may be temporary or permanent, depending upon the nature of the industry. Natural resource – dependent communities will be familiar with this phenomenon – mines open and close; sawmills expand, then shutdown; fish plants spring up in response to demand then close. However, booms can also occur for other reasons. Trade agreements may change import/export economics and result in, for example, new automotive plants opening or manufacturing plants closing. New technologies may arise, and together with favourable incentives, result in construction of new factories or technical organizations/institutes. None of these are necessarily permanent, but in a large growing economy the opening or closure of a plant or mine will be less consequential than in a small economically-stagnant town. Would the Office of Public Health have felt compelled to issue a warning about the ‘boomtown’ impacts of a new Google server farm plant in, say, Florenceville? Or is this something to be worried about only where blue-collar workers are involved? I found the concern that the report had with the infusion of cash into small towns and rural areas to be patronizing, even prudish. The report referred to temporary camps used to house workers in the Fort McMurray AB area. I thought that the suggestion that such ‘man-camps’ would be developed to any extent in New Brunswick to be a bit far-fetched. Given what was known about the geology and distribution of shale gas deposits at the time, most workers would most likely be housed in small towns and nearby urban areas. Even if intensive fracking development occurred in New Brunswick, I find the Chief Medical Officer’s concerns here way over-the-top. Water contamination: The main threats to water quality from fracking appear to be methane and various additives to water injected into gas-bearing rock formations. In this review of water quality in New Brunswick, you can find evidence that methane is naturally found in domestic groundwater, especially in southeast and central NB (where most gas deposits are likely to be found). Further sampling found that 55% of wells tested contained detectable methane, and methane concentrations in domestic wells near fracked sites had methane levels similar to wells not close to fracked sites. In other words, there’s no evidence that fracking in NB has resulted in any methane contamination of domestic water. This testing also confirmed results discussed above – there are many areas in NB where water quality is reduced due to naturally-occurring materials. Research conducted in other jurisdictions has also shown that fracking has very limited negative impacts on water quality, except in locations where water wells are very close to fracked sites. I find it puzzling from a risk management perspective that there a focus on the possible negative impacts on water quality of this relatively new technology (fracking), while apparently ignoring the possible impacts of the disposal of minimally-treated landfill leachates into water treatment plants. The latter, after all, has gone on for decades and yet we know next to nothing of any possible impacts on watersheds (which is where the ‘grey’ water from water treatment plants is dumped). The fracking industry, for all its faults, is able to tell us a lot more about chemicals used in fracking than we are told by public bodies in New Brunswick about any toxic materials in landfill leachate. The dumping of landfill leachate into water treatment plants is not a secret; the annual landfill management reports document the shipments. If you are a public official charged with protecting the public’s health, and have an interest in drinking water quality, would you not want to raise concerns about this practice? And would local media not want to raise these concerns with you? Would media not want to inquire about the relative risks from these different threats to water quality and public health? Everyone it seems is happy to talk about ‘poisoning’ of the land by fracking operations, but few want to talk about our dumping of waste pit leachates into watersheds. There’s an interesting side story to the methane issue, which touches on the way media handled the methane reporting. 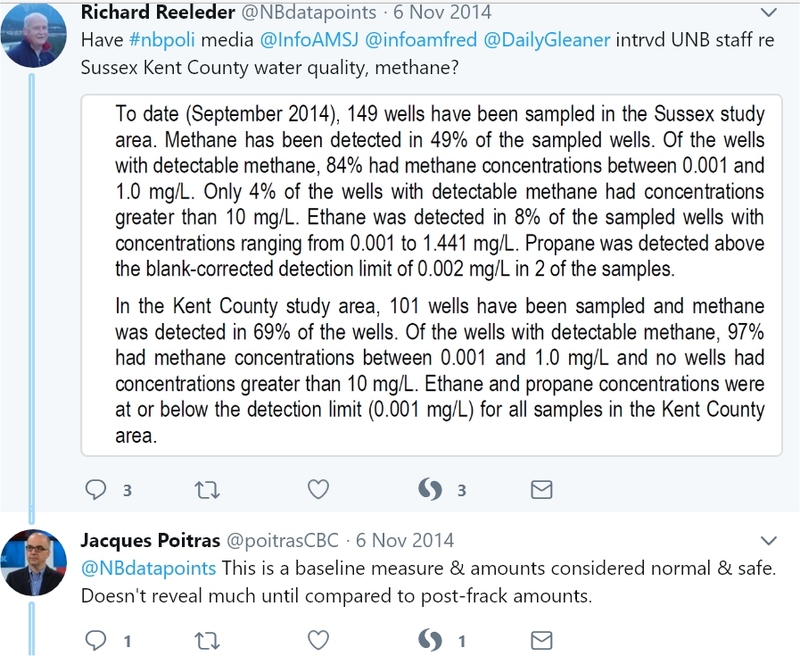 Some of the data on methane in New Brunswick well water were first released to the public at the ‘Exploration, Mining and Petroleum New Brunswick Conference’ held in Fredericton 2-4 November 2014 (about two years after the Cleary report on fracking was released). These were ‘baseline’ data, designed to provide information on well water quality prior to fracking. Those results showed that methane was widespread as a natural ‘trace’ contaminant in NB well water. I was unaware that the conference was taking place, but heard a news report on CBC Radio from Fredericton that described these preliminary results. Insofar as I know, that CBC report was only aired once (to be fair, it also took a while for Brunswick News to cover this story). A few days later, I queried a CBC journalist as to why these data were not reported in more detail. I was told that this was ‘not news’ – baseline natural contamination was not news. 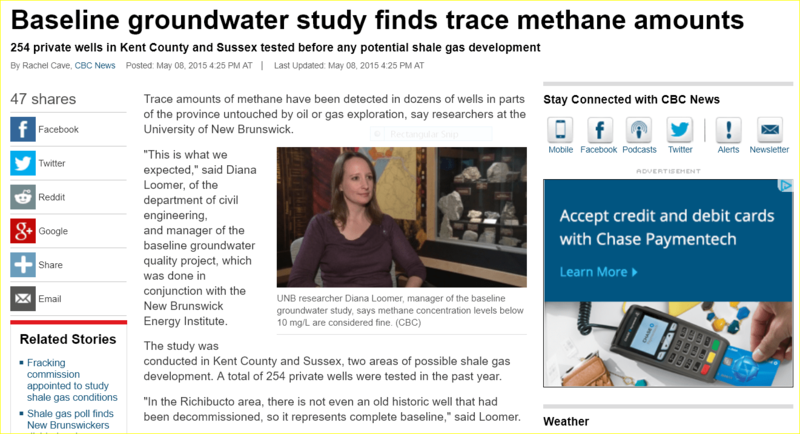 I would have thought that, given the uproar over methane in water from fracking, the fact that methane is already widespread in NB drinking water just might be newsworthy. And yet, someone at CBC New Brunswick HAD filed a story on that baseline data, and that story was read as a news story on CBC Radio NB at least once. So, someone must have changed their minds – it was a story worth reporting, then it was not. Very strange. I’d like to see the internal communications that went on over that story. A few months later, the baseline data was again determined to be ‘news’. Is there risk from fracking? Of course. But when you compare those risks to the risks to public health from other issues described here, you might wonder whether balanced risk assessments were done and whether public health budget dollars were allocated accordingly. You also might wonder whether the media did a professional and fair job in covering this issue. Glyphosate is a widely used herbicide. It is relatively non-selective with respect to species of plant targeted; that is, unlike many other herbicides, it can be used against large-leaved plants (shrubs, tree-seedlings, vegetables) as well as grasses. After application to the plant, it is absorbed by green tissue (e.g. leaves) and translocated to growing points in the plant, including the roots. New leaf or shoot production is reduced. Root tissue is killed or injured and that, in turn, reduces the above-ground growth of the plant. Plants may be killed outright (although death may not occur for several weeks), or, in the case of many established shrubs and perennials, growth may be reduced for a period of time. In many forestry applications, the goal is usually to stunt the growth of deciduous shrubs and seedlings (e.g. hardwood species and colonizers such as wild raspberry, etc) so that planted conifer seedlings may have a growth advantage. That may or may not be a good thing, depending upon your point of view, but we aren’t discussing here the impact of herbicides on forest ecology or sustainability (I’ve commented on those issues previously). Areas of crown land treated with herbicide (including glyphosate) are shown here. Total acreage treated with glyphosate annually in New Brunswick is approximately 25,000 ha, according the the National Forestry Database. That’s about 0.3% of the Province’s Crown Forest, according to ForestInfo. As you can see from the map, the areas treated are discrete and the percentage of forest treated in a given year is quite small. There is little evidence that the glyphosate molecule is environmentally persistent; half-life in soil varies from a few days to less than 1 year. An area sprayed one year is unlikely to be a source of harmful amounts of glyphosate the following year. Given those considerations, the risk of glyphosate exposure to humans from forestry applications would appear to be small. In fact, the greatest risk of exposure to glyphosate is probably not from forest application at all. Instead, the greatest risk of exposure for most New Brunswickers is probably via their own use of glyphosate around their home as a weed-killer. Glyphosate is, after all, widely available in home garden centres, hardware stores, etc, for that just that purpose. What percentage of NBers using glyphosate (sold under trade-names such as Roundup, Totalex, Wipeout, etc) follow the label instructions with respect to personal protective equipment? Very few, I’m guessing. And what percent of those people realize that they are using glyphosate? Few, most likely. In any event, the risk of exposure from domestic uses of glyphosate is likely higher (and possibly much, much higher) than from forest application, even for those cases where tree-planters or other forestry workers might be subjected to spray drift. From a human health perspective, then, why would the Chief Medical Officer for Public Health launch a ‘study’ of forestry use of glyphosate, but not one on around-the-home usage? Although a great deal of concern has been expressed with respect to the human health impacts of glyphosate, both the hazard level and the risk of exposure appear to be small in most cases. The European Food Safety Authority concluded in 2015 that glyphosate was unlikely to pose a carcinogenic hazard; The European Chemicals Agency and the US Environmental Protection Agency (2016) made similar determinations. The scientific evidence just does not support the level of concern expressed by some, and, following reports of conflicts of interest and data manipulation, even the IARC decision to classify glyphosate as a ‘probable carcinogen’ is under fire. Opponents of glyphosate use (many of whom also oppose GMO technologies) have claimed that emails and other documents show collusion between glyphosate’s manufacturer Monsanto, scientists, and regulatory agencies. Those documents, however, don’t show evidence of attempts to manipulate research data, and it is the datasets that regulators examine. One of best sets of evidence supporting the safety of glyphosate come from epidemiological studies that assess the effects of real-world levels of exposure to the product in real-life situations. A recent report (an epidemiological survey of over 44,000 glyphosate users) from the Agriculture Health Study of the U.S. National Cancer Institute concluded that ‘glyphosate was not statistically significantly associated with cancer’. Systematic reviews of scientific literature also found that there was no strong evidence that glyphosate causes cancer, and that glyphosate is not associated with other illnesses in humans. While there might be weak associations between exposure to certain herbicides or pesticides and certain cancers, the same can be said for the links between consuming BBQ’d meat and cancer, working night shifts and cancer, consuming certain preserved vegetables and cancer, or working in a hair salon and cancer. The proposed connection between grilled foods (e.g. barbecued meats) is especially interesting. The supposed carcinogen in BBQ meat is acrylamide, which can be formed in meat and other grilled food as a result of cooking at high temperatures. WHO/IARC classifies acrylamide in the same group as glyphosate – as a “probable human carcinogen”. Do you think that the average New Brunswicker is more likely to be exposed to acrylamide in grilled meat, or to glyphosate? Seems to me it is highly likely that exposure to and ingestion of acrylamide is many times (perhaps thousands or millions of times) greater than exposure to glyphosate. If you were charged with helping to safeguard the health of citizens of the Province and had limited resources available, would you put more effort into bringing to the public’s attention the dangers of acrylamide, or the dangers of glyphosate? Perhaps a commentary on the relative threat to public health from Ribfest or the consequences of eating grilled meat would have been in order, but had that been done I expect that the Chief Medical Officer would have been laughed out of town. Sulfur, another fungicide used by the organic vegetable industry, has been shown to cause respiratory disease in children exposed to sulfur applied to California vegetable fields. Given the lack of evidence that real-world use of glyphosate has significant risk to health or to the environment, and the evidence that ‘organic’ fungicides do pose such risks, it is fair to ask this question: who is more environmentally responsible when it comes to pesticide use – the forestry industry in New Brunswick or the organic vegetable growers in New Brunswick? A corollary question would be – what kind of risk/benefit analysis would lead the former Chief Medical Officer for Public Health to investigate one but not the other? You can find all sorts of nonsensical stuff online about the supposed harmful effects of glyphosate on wildlife or the environment. For example, there are the wild claims that glyphosate must be responsible for the antlered female deer found in New Brunswick – it seems not to have occurred to folks to ask about the frequency of antlered does in other parts of North America. They might be surprised to learn that as many as 1 in 900 female white-tailed deer may have antlers. Then there are the claims about impacts on salmon or endocrine disruption – claims that ignore the limited areas being treated, the concentration of glyphosate in the sprays, and the half-life of the glyphosate molecule. And, no, there isn’t much evidence that glyphosate harms bees either. The risk of these impacts seems very low, and evidence of harm in real-world scenarios is lacking. A related concern is with the adjuvants/surfactants added to glyphosate – do they increase the risk of harm? These materials are used to improve coverage of the target plant material and improve performance. Many if not all pesticide applications in conventional and organic agriculture involve the use of various adjuvants. In Canada (unlike the US), the regulatory process prior to approval of adjuvants for use must be supported with data showing efficacy and environmental impacts. While some adjuvants have been shown to have deleterious impacts on various insect and aquatic species, the low concentrations used commercially suggests their impacts are most likely limited. Glyphosate has been used now for many years – it is not a new product. You’d expect evidence of strong associations between exposure and ill health by now if the product was as dangerous as some would have us believe. When associations are repeatedly shown to be weak, you have to wonder if there are alternate explanations for the alleged link. I recognize, however, that anyone who dares to suggest that glyphosate is not a scourge that must be banned will be dismissed as a shill for the ‘corporate evil-doer’. Even someone who innocently points some potential health benefits of the glyphosate molecule might be so dismissed. If you are interested in an overview that deals with the questions often raised about glyphosate, try this (it’s a good review for members of the media). Given the fact that the associations between cancer and glyphosate appear to be weak, you have to ask yourself just how high on the list of public health ‘concerns’ glyphosate should be. By contrast, the association between E. coli exposure and ill health is very strong – should that not be of more concern to public health officials? If both BBQ meat and glyphosate have weak associations with cancer or other aspects of poor human health, why would the Chief Medical Officer for Public Health decide to pursue glyphosate but not grilled meats from the BBQ? And if it is high on the list (for some unclear reason), why target forest applications when exposure from domestic use products is, for most NBers, likely to be both more frequent and at higher rates of exposure? In any case, if you plan to do a ‘review’ of glyphosate, exactly what would you be reviewing? Short and long-term health impacts? How would that be done? How would you measure exposure and prevent confounding with other factors? Wouldn’t you need to possess a fair bit of expertise in some very specialized areas of research to advance the ‘study’ in any meaningful way? Are the resources available to do that kind of study? What would it cost? And what would be the scientific justification for undertaking those considerable costs? Given the resources available, was it not most likely that the ‘study’ would simply be another literature review? If the latter, would the review compare and contrast threats from acrylamide, alternative forestry practices, and glyphosate, or just glyphosate? And if this paragraph of questions is not enough for you, let’s add a couple more. Why is that no one in the media appears to have raised these rather obvious questions with the Office of Public Health or anyone else? Why was there so much attention to the hysteria around this issue, and so little attention to science and risk assessment? In the end, of course, the ‘study’ was carried out by Dr Cleary’s successor, Dr. Jennifer Russell, and consisted of a literature review and an assessment of risk from glyphosate. The conclusion was that risk of exposure to glyphosate was likely to be very small. The conclusions of the report were supported by at least one member of the IARC committee on glyphosate, who happens to be the chief science officer for Public Health in Ontario. For the sake of argument, let’s say that use of glyphosate was banned in New Brunswick. That is certainly possible; other jurisdictions have done just that, and possibly a Provincial government might conclude that the public approval gains from throwing the anti-glyphosate folks a bone might outweigh the complaints of the forest industry. If that were to happen, though, how would risks to public safety change? There is not much evidence supporting the idea that there is a significant risk from glyphosate to residents of the Province, so a glyphosate ban is unlikely to result in a meaningful decline in risk. On the other hand, removing herbicides as a tool in forestry management and replacing it with manual brush removal does pose risks. Chainsaws and other 2-stroke engines produce fumes that contain known and suspected carcinogens and local exposure rates to woods workers may be very high. Locally high rates of carbon monoxide may also result from operation of these tools in dense brush. Furthermore, forestry jobs are among the most injury-prone in Canada. By replacing glyphosate with manual removal of shrubs and deciduous trees, risk of injury and disease to New Brunswick residents is likely to increase, not decrease. In addition, manual browse removal is still browse removal and so impact on deer food supply (if any) remains in place. While the Chief Medical Officer has considerable freedom of action (and rightly so), citizens are certainly entitled to hold that office to account for those actions. The decisions made by the Chief Medical Officer on use of the taxpayer-provided resources made available to the office should always be open to question and review. If Dr Cleary was intending to launch a study of glyphosate, then ‘why’ is certainly one legitimate question. Another would be – ‘do you have the skills/resources to do that?’ Were (and ‘are’) there no curious journalists out there to ask those questions? I can, to some extent, understand why members of the media failed to question Dr Cleary more closely as to her priorities in use of public funds. Although it is my opinion that she was not making good use of her resources, you might not agree. Either way, I expect professional journalists to at least make a reasonable attempt to be fair. Brunswick News is owned by the Irving group of companies, a dominant economic force in New Brunswick. Most of the daily newspapers in NB are controlled by Brunswick News, and that has led to concern that this concentration of press ownership might make it more difficult for critics of Irving industries to get a fair hearing. Irving companies are heavily involved in the forestry industry and also support the use glyphosate in forestry management. The Irving Oil refinery has been accused of releasing air pollutants. Air pollution has been correlated with adverse impacts on health. It has been suggested that there is a reluctance on the part of Brunswick News employees to tackle stories that might either put the Irving group of industries in a bad light or even give issues more coverage when that coverage might seem to be disadvantageous to the Irving group. Similarly, when the Chief Medical Officer for Public Health raises concerns about practices, plans, or policies of the Irving group of companies, these journalists might hesitate to ask any hard questions of the Officer. After all, any attempt by Brunswick News journalists (given the Irvings’ economic interests in the Province) to raise questions re the priorities of the Chief Medical Officer for Public Health (no matter how well-intentioned the questions might be) would be met with a certain amount of skepticism, if not scorn. On the other hand, I find the attitude of CBC Radio journalists on the priorities of the Chief Medical Officer to be rather baffling. Would not the ‘public broadcaster’ want to address the public interest here? What is the ‘public interest’? Well, surely, that would at the very least involve asking whether the public servant in question is acting prudently within the mandated areas of responsibility, whether tax dollars are being spent efficiently, or whether public servants were acting in the interests of the public. Seems to me that certain employees at CBC New Brunswick might be confusing ‘public interest’ with telling certain members of the public what they want to hear. More than that, it seems to me that certain staffers at the CBC have come to view themselves as a sort-of ‘Loyal Opposition’ to the corporate interests of the Irving group. Anything proposed or endorsed by the Irving group or Brunswick News must, it seems, be countered by the CBC. They certainly are entitled to be suspicious and skeptical of corporate interests in the Province and hold them to account, but that is not a reason to ignore the weight of the evidence, or give every crank a hearing. I’d hate to think that the taxes I pay towards operation of the CBC were being used, not to investigate various issues on behalf of the public interest, but instead to advance the views of various groups or organizations that claim to, but do not necessarily, represent the public interest. Sort of a ‘corporate capture‘ in reverse. Now some may think that this is fine, that those actions somehow balance out the perceived failures of Brunswick News. I don’t agree. I believe that the public broadcaster needs to be fair and professional, and avoid partisanship. That does not mean providing a false balance or a false equivalence – it does mean looking at the weight of the evidence, even where that weight comes down on the side contrary to ‘popular opinion’. There are plenty of questions that could be raised with respect to the priorities and actions of the former Chief Medical Officer for Public Health. CBC journalists have, in my opinion, failed to ask them. Brunswick News journalists apparently were afraid to ask them. Either way, the public interest is the loser. This entry was posted in Environment, Governance, Health, Politics, Water by Datapoints_NB102. Bookmark the permalink.